Make sure your business or e-commerce website is properly optimized. Landing page performance, conversion rate, bounce rate, goal completions - the list of engagement metrics goes on. Don't spend your time copying stats into an Excel spreadsheet; let our software pull your numbers and create your Google Analytics reports instead. Why not make it quick and easy to create comprehensive Google Analytics reports for clients? In addition to a Google Analytics account, you can integrate other SEO tools including Google Search Console, AdWords, Ahrefs, Moz, SEMRush and more! If you have some custom data you want to include, just upload a CSV file and our tool does the rest. You already know the KPIs and important metrics you need to track: visitors, session duration, bounce rate, traffic source and more. Our preset widgets enable you to build your Google Analytics report quickly and easily. You can also choose your own metrics, dimensions, and filters, with our custom widgets! Spread the good news! Use your Google Analytics reporting tool to send emails with a link to the web version or an attached PDF version of your report, protect it with a password if you want, and make sure your report gets the visibility it deserves. There's more to online marketing than search engine optimization and organic search. We also support all the major web analytics, social media, and digital marketing tools, which means you can create comprehensive online marketing reports that show you how all your digital marketing campaigns are performing. 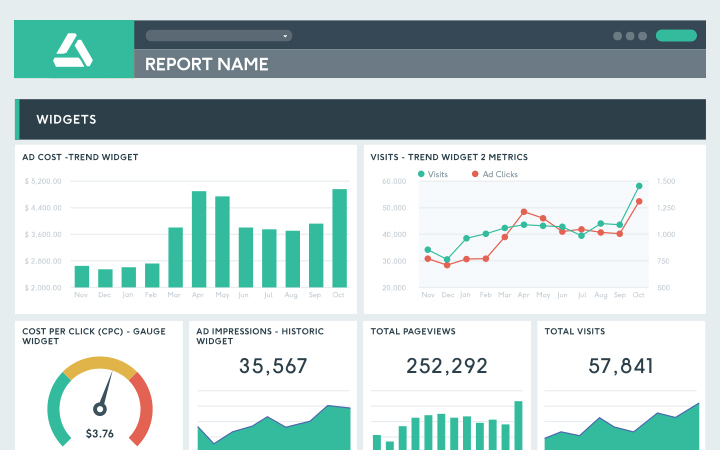 Get a complete picture of all your digital marketing efforts in one single dashboard using DashThis. Google Analytics is key to understanding how your website is performing. Why not make it quick and easy to track your digital marketing campaigns? That's what these folks have done: they use DashThis as their official client reporting tool. That way, they can use their extra time to create more value for their clients instead of inputting data manually. Simplicity is often the best policy and we certainly think that's true for digital marketing reporting. Our tool is comprehensive, customizable, and you don't need a computer science degree to use it. But if you do need some help along the way you can always speak to your dedicated account manager; (s)he is here to support you every step of the way. What if you could have more time to dedicate to your business and save money at the same time? It sounds too good to be true, but with DashThis that's exactly what will happen. You'll be saving time (and money) by using our tool to produce your reports, and you can use that extra time to work on adding value for your clients and customers. Get a report with a custom, white label design that reflects your brand's colours, fonts and overall vibe. Save on a custom URL and design with a white label bundle that includes both! Organic traffic, goal conversion rate, return traffic, page views, bounce rate - the list of KPIs you can include in a Google Analytics performance report goes on and on. Luckily, we've created a template you can use to get you started that includes all the main KPIs you'll need to track. It's also customizable so you can include the KPIs and visualize the data exactly how you want. We're not just a great Google Analytics reporting software. We're also a group of dedicated people who are happy to help with your client reporting whenever you need it.